Ruby on Rails is one of the most popular web development frameworks, and Heroku has become a popular place to quickly deploy applications - and both for very good reason. For this guide, you will need a Heroku account (it's free to sign up). This guide also assumes that you're running OSX 10.10. Beyond those two assumptions we will try to go from ground zero to have a local rails development environment and an environment on Heroku. xcode-select --install and you will be prompted to install the Xcode Command Line Tools. Git is a popular version control software, and it will be required to push to Heroku in later steps. If you've successfully installed Xcode, git will be installed as well. You can go ahead and configure git now. $ git config --global user.name "Your Real Name" $ git config --global user.email me@example.com $ git config -l --global user.name=Your Real Name user.email=me@example.com The above commands will set your name and your email address. Then the third line simply checks to make sure they were set properly. These values will be used to identify your commits. Homebrew is a popular package manager for OSX. There are other great package managers, but for this guide we will use homebrew. RVM is the ruby version manager. This allows you to have multiple ruby environments on the same machine. You may not need multiple environments, but it's the easiest way to setup the environment you need for this guide. The --ruby flag installs the latest version of ruby. $ echo "gem: --no-document" >> ~/.gemrc Lastly, we should install Nokogiri in the global gemset. Many gems, including rails, depend on Nokogiri. For this guide, we will create a new gemset to install for this specific version of rails. You could skip this command and by default you would be installing rails in the global gemset. $ rvm use ruby-2.2.0@rails4.2 --create At the time of this writing, rails 4.2 is the current version. If a new version is out you can name the gemset it appropriately. I typically keep all of my development projects in ~/Developer, but you can organize your projects however you'd like. At this point, we're going to switch gears. You could skip straight to creating your rails app and worry about this step later if you'd like, but I think this is the most logical point to get your heroku environment setup. As mentioned in the guide description, you'll need to set up an account on Heroku. It's free to sign up, so go ahead and do that if you haven't already. Make sure to remember your login information. Install the Heroku Toolbelt. This gives you access to the Heroku command line tools, which allow you to deployment your project files to your Heroku environment which we will do in subsequent steps. $ heroku login You will be prompted to enter your email address and password. rails new . --database=postgresql Next, we should make sure all necessary gems are installed. The following command will check and install all gems in your Gemfile. So if you install a gem on your local environment, you need to add it to your Gemfile as well. While developing, you'll find that many bugs can be fixed by either making sure your Gemfile is up to date or simply running the following command. We should be setup and ready to start developing, but first let's test our local environment. 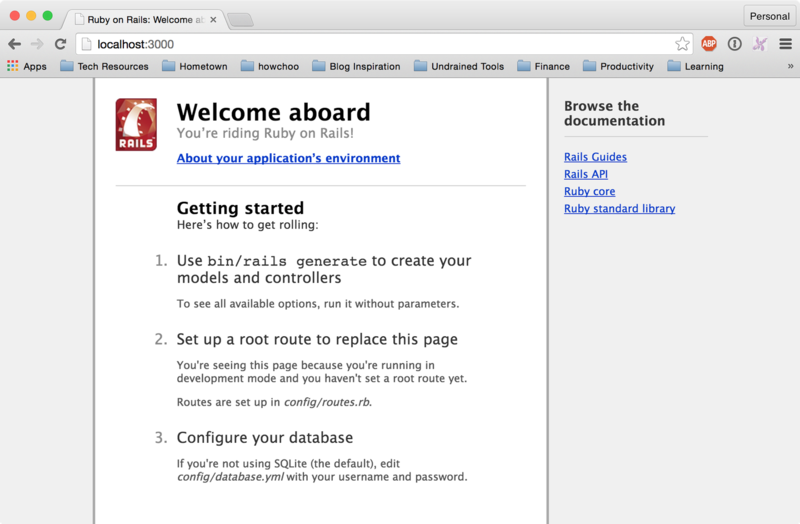 This will create a local webserver running your rails application. To visit see your app, go to http://localhost:3000 in a web browser. You should see the Rails welcome page. Now that we've got a working - although quite boring - rails application, we can go ahead and push our code to Heroku. You might decide in the future to build out your application a little more before deploying, but for this guide we will just deploy our bare application so you can get familiar with the process. First we'll want to initialize this application in git. $ git init $ git add . $ git commit -m "init"
This initializes, adds all of the code, and creates your first commit message. Now we'll create our heroku application. This can also be done from the Heroku website, but we'll do it here for simplicity. 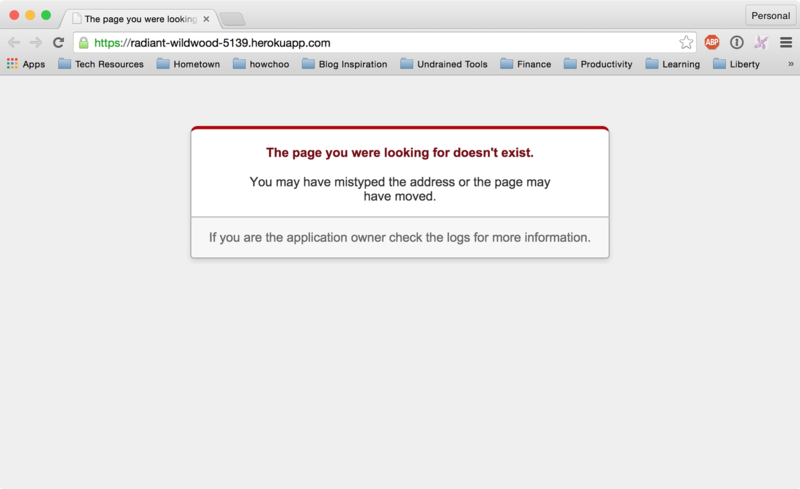 We'll want to view our application on Heroku, even if it doesn't do anything interesting. Now, let's check out our application in the browser! This will open up a new browser tab to view your application on heroku. Since this is the production environment, we won't get any error messages or the rails test page. It will simply 404 since we haven't set up any routes or controllers. But at least we know it's working. If you found any issues with this guide, please report them. I'm hoping this can serve as a great guide for beginners and a reference for more experienced developers.